This is a whale of a meal! 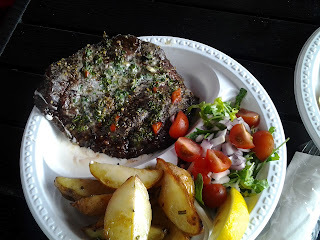 Yes, a whale meat steak mit potatoes and small salad - $30. The texure is between a filet and an Alfred's-perfectly-aged ribeye and actually tastes like beef. We need to grow more whales! Below is the view from our 'window' in the basement (deck 2) of the Brillance. 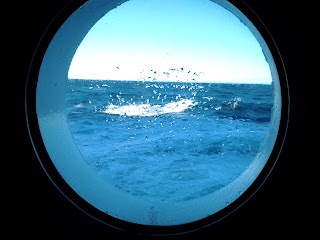 The room was comfortable and easy to get on and off the big boat.